5G is finally here. Carriers have launched networks, and the first mobile devices that can use them are hitting the market. Fortunately, so are the high-speed mobile interfaces that devices need to keep up with 5G and the new applications that are set to emerge from it. Thanks to constant development by the MIPI Alliance, current MIPI interface specifications already are being built into the first generation of 5G smartphones and will meet device performance needs through 2021 and beyond. 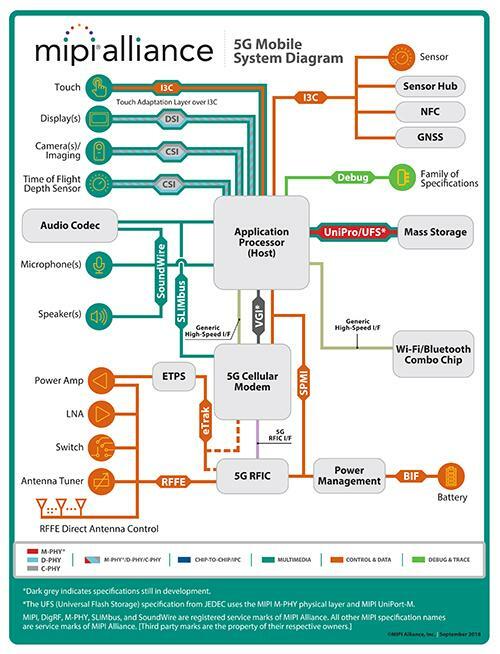 The system diagram below illustrates how various MIPI interfaces enable a typical 5G smartphone. The first major use of 5G will be faster service for smartphones, sometimes called eMBB (Enhanced Mobile Broadband). With peak data rates of 5 Gbps in its first iteration (3GPP Release 15) and up to 20 Gbps in the next (Release 16), 5G will provide enough network speed for rich audio, more advanced cameras and displays, and augmented and virtual reality (AR/VR) experiences. 5G will also expand the power and reach of the Internet of Things (IoT), through mMTC (Massive Machine-Type Communications), and technologies including telemedicine and autonomous vehicles, using what has been termed URLLC (Ultra-Reliable, Low-Latency Communications). MIPI interface specifications have enabled new mobile applications since the dawn of 3G. By steadily improving the speed, latency and power of the links among mobile components, they prevent those interfaces from becoming bottlenecks. MIPI specifications include standards for audio, imaging and video, physical layer connections, radio front ends, control, storage and other needs. Here’s a look at how MIPI interfaces meet 5G demands today and will support next-generation devices and use cases. More details are available in a MIPI Alliance white paper intended to inform and encourage collaboration about how current MIPI specifications can be enhanced and new ones developed. The MIPI SoundWire interface, along with MIPI SLIMbus, will be deployed in the first wave of 5G smartphones this year. MIPI SLIMbus is designed primarily for transporting audio between larger components, such as 5G modems and application processors interfacing with peripherals such as Bluetooth, FM and audio subsystems/codecs. MIPI SoundWire is a complementary specification to SLIMbus. It consolidates the key attributes in mobile and PC audio interfaces and provides a common, scalable architecture to serve multiple devices and market segments. It helps manufacturers incorporate low-cost, high-quality digital audio components such as digital microphones and speakers into smartphones and other devices. MIPI CSI-2 is the ubiquitous camera interface for 4G/LTE smartphones and is being used in the first wave of 5G smartphones, providing the interface between the application processor and the camera sensors. Paired with the MIPI D-PHY or C-PHY physical layer specifications, CSI-2 enables the evolution of 5G phones from two rear cameras to multi-camera designs including those with dedicated depth/time-of-flight (ToF) and face-detection sensors. The current CSI-2 version already provides support for 4K/120fps and 8K/30fps video capture capabilities that are likely to be available in the future. MIPI’s CSI-2 roadmap continues to drive advanced capabilities to enable even higher quality video, emerging 5G use cases such as connected vehicles, IoT devices, AR/VR and AI/machine vision, with features such as longer reach, latency reduction, eye tracking and real-time vision processing. The numbers are staggering: The bandwidth required for mobile displays has grown by 8-10 times every five years, and MIPI DSI-2 specifications continue to support state-of-the-art display requirements with ample headroom for even higher resolution, color depth and frame rates well into the 5G era. MIPI’s latest DSI-2 specifications offers 8 Gbps of physical layer bandwidth per lane, and in collaboration with VESA, it incorporates VESA VDC-M technology delivering 5:1 visually lossless compression and enabling each DSI link to deliver up to 120 Gbps of effective bandwidth. This allows ultra high-resolution displays beyond 10K to be supported in phones, tablets and AR/VR HMDs, which demand very high PPD (pixel per degree), beyond the 2021 timeframe. Also, by effectively reducing physical bandwidth needs, DSI-2 reduces costs and extends battery life. When DSI-2 is deployed along with CSI-2 for cameras, MIPI I3C and MIPI audio devices in AR/VR headsets, a low-latency, enhanced time synchronization system can be created to combat “VR sickness” with features like eye tracking and I3C timing control protocol. The MIPI family of physical layer specifications is already widely used in LTE devices and is ready for 5G. Upgrades of C-PHY and D-PHY (for camera and display links) with higher data rates are in the works to enable even more advanced 5G products and applications. They also extend the reach to support IoT use cases with longer channels than in mobile form-factor devices, while preserving the low power, low latency, and low EMI advantages of MIPI PHYs. MIPI M-PHY is used in the high performance JEDEC Universal Flash Storage (UFS) interface in conjunction with the MIPI UniPro transport protocol. UFS 2.1 is widely deployed in high-end 4G/LTE smartphones, and UFS 3.0, with an unprecedented aggregated transport bandwidth of 23.2 Gbps per direction, is poised to become the ubiquitous flash storage interface in the 5G era. As vehicles become more connected and automated with the help of 5G, MIPI is hard at work on a new interface. MIPI A-PHY, a long reach physical layer specification targeting automotive and other use cases, will allow manufacturers to connect camera sensors and displays to onboard computers by combining control data, high-speed data and optional power on a single link. This helps reduce cost, weight and power consumption. MIPI RFFE is the control backbone for RF front-end devices such as amplifiers, filters and switches in 4G/LTE handsets and supports advanced features like MIMO and carrier aggregation. The latest version introduced new message types, supports flexible bus configuration and longer reach to meet the first generation 5G handsets. Work already is underway to optimally support the massive MIMO and millimeter-wave radios of the future evolution of 5G NR. 5G performance will open up new uses for sensors in smartphones, connected vehicles and IoT devices. The MIPI I3C specification, developed as an interface for motion, biometric, environmental and other sensors, is ready to help manufacturers design the next generation of systems. I3C is emerging as a critical interface for sensors, hubs and application processors. It lets developers consolidate an array of low-speed interfaces such as I2C and SPI into one type of link, simplifying device development and cutting costs. I3C was designed for low pin count, low gate count, low power consumption and is suitable to be implemented on MEMS sensors. I3C provides substantially higher performance with up to 33 Mbps of control bandwidth and low EMI. MIPI device interfaces will be essential for the experiences that consumers and businesses expect from 5G. By meeting current 5G requirements and planning for advanced RF, efficient messaging and rich multimedia, the MIPI Alliance is not just keeping up with mobile evolution but helping to drive it forward. Device and smartphone vendors, operators and others can look to the innovative MIPI roadmap as the standard for 5G-ready interfaces and a toolkit for future competitive differentiation in the era of 5G. 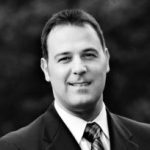 The post 2019 to welcome 5G devices: An overview of MIPI interfaces enabling 5G readiness (Reader Forum) appeared first on RCR Wireless News.